Balance is defined as a force counteracting the effect of another force. Harmony is defined as an internal calm or a pleasing arrangement of parts. Uke attacks and nage blends with the force in a pleasing arrangement of parts and then through balance nage’s force upon uke is counteracted by the effect of the earth on uke’s body in nage’s technique. Through good ukemi uke brings balance or counteracts the effect of the earth. If uke’s fall is bad or incorrect ukemi, he or she will discover harmony or cause a pleasing arrangement of uke’s parts (pleasing that is to nage) through the impact with the earth. 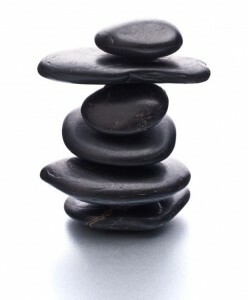 I understand that this does not seem the usual way we understand or interpret the words’ balance and harmony. Similarly the way we interpret or understand irimi-tenkan is to shorten the term, just like we do when my first name Eugene becomes Gene, irimi- tenkan becomes tenkan. However, I see this habit we all have has become more than just shortening the spoken technique name. The very power and meaning of the technique’s name is out of balance and the full concept of irimi-tenkan seems lost. I only recently came to understand the effects of our technique name shortening habit while attending a Saotome seminar. During that seminar, Saotome Sensei had mentioned watching a well known Hong Kong martial artist in a martial art film. And even though Saotome knew the fighting was for entertainment, Sensei said he kept wondering why the actor did not do irimi-tenkan. Irimi-tenkan! I never remembered Saotome calling it tenkan! The term was always irimi-tenkan. But it seems like all the students, including me, shortened the term. Back at the Dojo, Messores Sensei always described tenkan as irimi-tenkan, in other words entering or meeting then blending with the attack. In order to have balance one has to meet the uke’s force in order to counteract the effect. Let us take a moment to look at or think about balance and in doing think about irimi-tenkan. Enter East, Turn WestThe Asian symbol for yin and yang is well known as the two opposite colors and equal shapes. Balance. This seems true in every aspect of Aikido this “constant of opposites” this harmony. Irimi is often referred to as choosing to enter and face death. The moment of Now becomes the moment of creativity or life, or the moment becomes death. Life or death in that moment it is in balance. That moment is occurring on several levels all at once in the body, mind, and spirit. In regards to the spirit I suppose we might find references in Buddhism regarding that moment, instead let’s take an intellectual irimi-tenkan, step forward east and turn west. In Mysticism: Christian and Buddhist the Eastern and Western Way by D.T. Suzuki, (Macmillan 1957) Suzuki Sensei writes about Meister Eckhart’s (a western Christian thinker/teacher/minister) sermons where Eckhart talks about God’s day and soul’s day in which in God’s day all time is contained in the Now-moment. The balance of God in that Now is isticheit -western or tathata -eastern, God’s is-ness (forever is) and enlightenment in understanding God’s being – non being. Balance. What, you may be asking, does this have to do with irimi-tenkan and Aikido? It is irimi-tenkan. In regards to the mind within that moment when uke’s attack begins and nage’s response occurs, the first paragraph’s explanation of balance and the resulting harmony help explain how to see the moment. The harmony or internal calm of your spirit entering and becoming life and death. Your life, his death. In The Principles of Aikido by Mitsugi Saotome, (Shambhala 1989) Sensei asked who would know more of the true value of life than the one facing death. In entering free of the entanglement of possessive thoughts (i.e.” I have this to lose if I do not do this right!” or ” I will not look good if I do not do this right!”) Instead one steps forward past their fear, steps forward past the hate of the enemy, into and past even the realm of control the enemy’s spirit and into that moment of is-ness that is the Way of Aiki! Wait! What about the tenkan part of irimi-tenkan? That has not changed. You have counteracted the effect of the force attacking using irimi and gained balance. Tenkan directs the force to its harmonious conclusion. Harmony and balance occurs from beginning to end in the technique called irimi-tenkan. Gene Martinelli. Copyright © 2004 Jihonjuku Academy of Warrior Spirit. If IRIMI is the yang of the movement, then TENKAN must be the yin. Hard and soft bring/is balance. IRIMI-TENKAN brings/is balance. Exploring further into the point made in the first part of this series; we continue to look at how our understanding and interpretation of a word or words may have a profound effect in our ability to do the AIKIDO technique correctly. Our choices in accepting certain definitions color not only how we approach those techniques, but also limit our options and our growth in AIKIDO. You have counteracted the effect of the force attacking using IRIMI and gained balance. TENKAN directs the force to its harmonious conclusion. Blends/directs/leads/controls/ all are words used to describe the action of TENKAN. It is so easy to take the hardness of your spirit and the power of your force in IRIMI and drive right through UKE (remember IRIMI is also blending). In some situations and position of NAGE and UKE relative to their environment, driving through UKE would be the correct choice. Why then in certain situations do we as AIKIDOKA appear to choose to soften our spirit and blending with UKE, we turn ourselves? In entering UKE”S attack with a calm acceptance of death, either UKE’s life or yours, the mind and spirit become open to other possibilities. NAGE has taken control of the moment. But in this moment NAGE has done more than those few words seem to imply with the completion of IRIMI-TENKAN. MUSUBI, true martial harmony, must occur to actively choose TENKAN and complete the movement. Through MUSUBI (or in other words blending) we are given the opportunity to create life or perhaps a better choice of words might be an opportunity to spare lives, UKE’s life and your life. Your life however will be quickly over, if you think you will succeed by just having the proper mindset or a strong spirit without correct positioning and movement of your body. Nor will you be successful without correct distance, MA-AI, and timing, DE-AI. What seems the simplest of moves and the most basic of AIKIDO’s techniques contains all that is “AIKI.” IRIMI-TENKAN is often (if not always) the first move practiced. Why? All eight powers of the heavens are there in that movement: stillness and motion, powerful and relaxed, contraction and extension, hard and soft. So the simplest, easiest, and most basic move in AIKIDO encompasses everything that makes this an incredible art. Yet, in my opinion many of us as AIKIDO students tend to skip past the concept and principles in the IRIMI part of the movement and not quite grasp that the TENKAN part can be or is a strategy and a tactic in movement. I once heard TENKAN (shortened on purpose) described as AIKIDO’s version of retreating or back stepping. I really like that description and wish I could claim it as mine. In any conflict we must not only be able to react, but our mind and spirit had better, in that instant, have created and developed a strategy for defeating our opponent or UKE, too. Whether you are facing one opponent or many there is or should be a purpose to your response in your movement and choices. In having “Hard and Soft” in the title of this article I chose to focus or pay particular attention to these two aspects. When I was in the Army, back farther in time than I care to admit too. Retreating was never taught or described as retreating; it was called “Advancing to the rear” and the reasoning behind this was, it demoralized the troops’ psyche and put them in a defeated mind set calling the action “retreat.” This defeated mind set does not occur when we use TENKAN. Quite the opposite, what may have appeared overwhelming is now controlled by your center and your choice of action (technique). You had entered hard of spirit, not hard, tensed, and stiff of body. The force coming at you is strong and so you choose a soft response, TENKAN. Soft here does not mean or imply weak, limp, or non-martial. Rather it is a solid martial response and by choosing TENKAN we have redirected the force attacking us and thus negated the attack and taken control of this force. In that moment your choice becomes either life giving or life ending, for example you begin to flow into SHIHO-NAGE and by deciding in very small degrees of angles in your body position, UKE”S arm position, and the direction and force behind that throw the difference quite literally becomes life and death. One can see that the soft movement not only gave us multiple choices within the throw, but it also is a devastating power. Again, because it bears repeating soft here does not imply weak, limp, or non-martial. Choosing a soft response to a hard action you are able to control the balance and the moment! In addition, the technique happens because of the hard and soft choices you make in IRIMI-TENKAN? It is an amazing strategy that Aikido has in its ability to redirect rather than to always meet a hard force with a hard force. Softness means flexible, relaxed, and breathing and seeing with a clear mind. Your mind, body, and spirit can together or separately be hard or soft and not all in the same choices at the same time. It is in this state of relaxed clarity that one realizes that from the moment of contact and as you turn in TENKAN you are controlling and directing both yourself and UKE. Balance. So in certain situations as AIKIDOKA, we do indeed turn soft and turn ourselves blending and redirecting the force from UKE and therefore controlling and reaching balance. Ever notice that within the Yin and Yang symbol in the Yin or soft side there is a perfect circle of Yang or hardness, and within the Yang or hard side there is a perfect circle of Yin or soft side within. That is how balance is achieved. A hard exterior force is matched by a soft internal force and balance is restored. Water is often used in describing techniques or principles in martial arts. A favorite of mine is KOSHI-NAGE described as a wave crashing on a rock. In my mind, IRIMI-TENKAN is like a falling rock meeting the ocean. Unlike when a rock falls on land it leaves a mark to show where the rock impacted. When a rock hits the ocean, it is simply swallowed up by the water no matter how great the force of the falling rock. What really is the hard object and soft object in this analogy of the rock hitting the ocean? Because we have learned in science or more personally if you’ve ever taken a belly flop diving into a pool, that the soft surface of water actually causes a harder impact. Soft may well be the harder force, or the more correct frame of mind and spirit when doing IRIMI-TENKAN. You are seamlessly shifting from feeling like a hard driving force in that moment of IRIMI. Into a soft flexible redirecting force and like the overwhelming wave of water finding the weaknesses in UKE’s attack and exploit it. In order to move fluidly and be flexible in your timing and movement your body must stay soft to respond to an attack. In the core of that softness lies the crystal hard knowledge and strength of spirit to succeed and restore balance. IRIMI-TENKAN, the most basic of AIKIDO techniques contains a seemingly unlimited number of choices and incredible power. This becomes open to you if you do not limit how you understand and interpret the words used in describing AIKIDO and AIKIDO technique. Harmony and balance occurs from beginning to end in the technique called IRIMI-TENKAN. Credit & Thanks: I can claim to be the author of these series of articles, but without the editorial assistance, guidance, and down right straight-up and often heard saying, “Is that really what you meant?” help of Don Modesto. The two pieces of this series would not have been written. Don, thank you. Gene Martinelli. Copyright © 2005 Jihonjuku Academy of Warrior Spirit. Movement in aikido is often categorized by 4 words; Irimi, Tenkan, Omote, and Ura. These 4 words can be used to help describe any attack combined with any defense. I hope to clarify the meaning and use of these words and describe the subtle relationship between these terms. Before I begin, I should mention that I’ll be using the words nage and uke repeatedly. For the unitiated, nage means thrower and is generally the person who receives the attack and provides the throw, pin or neutralization. Uke means receiver and is usually the person who initiates the attack, but more specifically is the one who receives the throw. Let’s begin with some basic definitions. You should pay attention to which words are verbs and which words are adverbs. This is the first clue to their relationships. Irimi: verb. To enter. Refers to nage’s movement in relation to uke. Nage enters on a line toward uke as he receives an attack. Irimi is well represented by the symbol of the straight line. Tenkan: verb. To turn. Refers to nage’s movement in relation to uke. Nage turns in a circular motion as he receives the attack, usually by pivoting on the front foot and describing a 90 to 180 degree semi-circle with the rear foot. Tenkan is well represented by the symbol of the circle. Omote: adverb. In front of. Refers to the positional relationship of nage in regard to uke. Nage has moved in front of uke. Ura: adverb. To the rear of. Refers to the positional relationship of nage in regard to uke. Nage has moved behind uke. Ura is sometimes defined as the area outside or behind uke’s leading hand or foot while omote is viewed as the area inside or to the front of uke’s leading hand or foot. The most important thing to notice here is that as adverbs, omote and ura describe the verbs irimi and tenkan. There is a 3rd verb we sometimes use which I’ll just briefly mention and leave at that because it falls somewhat outside the scope of this discussion. Kaiten: adverb. Roughly translates as rotate. It’s applied when uke rotates 180 degrees… but unlike tenkan where the rear foot sweeps in a 180 degree semi-circle… the feet don’t move in kaiten. They pivot in place and the hips rotate to look in the opposite direction. Kaiten is, of course, used in kaiten nage, the rotating throw. It is also frequently used in conjunction with irimi to allow nage to reorient himself in the same direction as uke. It’s important to notice that irimi and tenkan are diametrical opposites. Omote and ura are also opposites. Omote and ura share the x-axis while irimi and tenkan share the y-axis. Viewed as a compass, irimi is north, tenkan is south, omote is west, and ura is east. 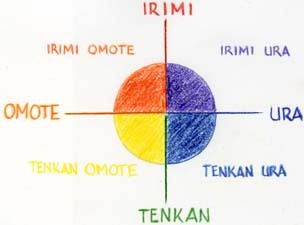 This compass model brings into focus not only the 4 compass directions, but more importantly the 4 quadrants movements between them; irimi omote, irimi ura, tenkan omote, and tenkan ura. Irimi omote: Nage enters in front of uke. Irimi ura: Nage enters to the rear of uke. Tenkan omote: Nage turns to the front of uke. Tenkan ura: Nage turns to the rear of uke. These quadrants can be used to accurately describe the movement in an aikido technique. Let’s look at the syntactical structure used to describe an aikido movement. The first quadrant movement describes how nage receives the attack. The second quadrant movement describes how nage throws uke. In our example here, nage receives the attack (side of head strike) with a tenkan omote or turning to the front of uke. Then nage throws with a shihonage (4 direction throw) using tenkan ura or turning to the rear of uke. It is not uncommon for people to abbreviate terms by saying something like, yokomen uchi shihonage tenkan. While this description is accurate, it is not precise. There is more than one way to perform yokomen uchi shihonage tenkan. Specifically, there are 4 ways. Nage could receive the attack (yokomen uchi) with tenkan omote or tenkan ura. Also, nage could throw with a tenkan omote or tenkan ura movement (of shihonage). Since there are 4 possibilities that can be applied in receiving the attack (first quadrant movement) and there are still 4 possibilities that can be applied in executing the throw (second quadrant movement) there could be a mind-numbing 2 ^4 = 16 possible combinations for just one technique. In practice there will be many fewer do to specifics characteristics of each technique. In the case of yokomen uchi shihonage, I submit there are 4 possibilites. For other techniques the number of combinations will be different. How many for tsuki kotegaeshi? Or shomen uchi irimi nage. I’ll leave these calculations as an exercise for the reader. Taking the time to fully recognize this model is more than an exercise in semantics. It opens the students mind to the possibilities and provides a tool for the student to discover techniques they may have never seen before.